This paper presents a new method for the automatic modeling of architecture. Building designs are derived using split grammars, a new type of parametric set grammar based on the concept of shape. 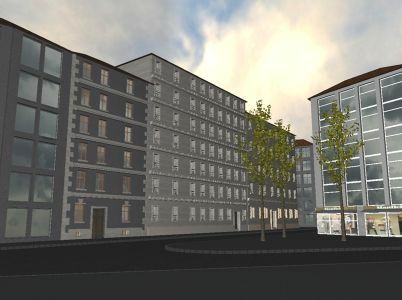 The paper also introduces an attribute matching system and a sepa- rate control grammar, which offer the ßexibility required to model buildings using a large variety of different styles and design ideas. Through the adaptive nature of the design grammar used, the cre- ated building designs can either be generic or adhere closely to a speci�ed goal, depending on the amount of data available. Contact: Peter Wonka, Michael Wimmer, Fran�ois Sillion, William Ribarsky. Version 2 AVI: This version of the video is encoded with a microsoft codec(~50MB). Last update on 20. Apr 04.